Tomb at Buncheon: Viewers will have no trouble accepting the portraits of Bay Area painter David Tomb as drawings. They hang unframed at Bucheon, some with collage elements that spill over a page’s rectangle, some with a second page attached to accomodate an observation or finesse a formal tight spot. Tomb does the opposite of allowing himself to “follow blindly” the images that form under his hand. 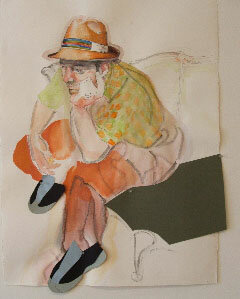 Each drawing plainly notates his view of a believably individual sitter. But representation continually competes for Tomb’s attention with his responses to what he and his materials have done. The process registers as forcefully as the subject, which may help explain Tomb’s affinity for eccentric-looking sitters. Their cobbled-together quality gives Tomb’s portraits a credibility lacking in most contemporary hand-made images of people. They center likeness not on appearance but on fabrication and the sense of every self as an unrepeatable patchwork.